It’s autumn, and along with the glorious changing colour of the trees, the days are shorter and a little colder, especially when we wake up. All of which may have you reaching for the porridge come breakfast time. Now, while we’re big fans of porridge and it’s certainly a great way to start your morning, there are many other ways to enjoy oats throughout the whole day. And many different types of oats to choose from too. Cheesy as it sounds, we love this recipe for oat bread. 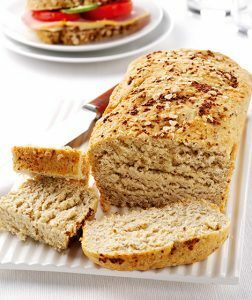 The oats add texture and flavour, and this loaf is perfect for sandwiches, or toasted with your favourite topping for lunch or supper. If Bake Off has inspired you, then get baking with oats! These cookies from Children’s Food Trust make a healthy choice for the whole family – and you can even get the kids involved in making them too. 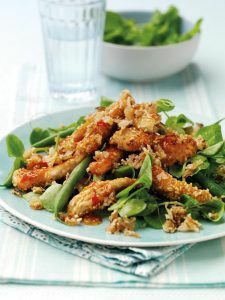 …or in this simple dish from Delicious that has us going nuts! 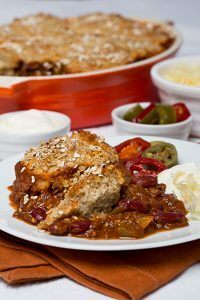 This sizzling dish from Dean Edwards, developed exclusively for Whole Grain Goodness, combines two of the TV chef’s favourite ingredients: mince and oats. How much chilli powder are you willing to add though? Whoa, brown betty, bam-ba-lam! Delicious, warming, fruity – this dish is perfect for autumn. 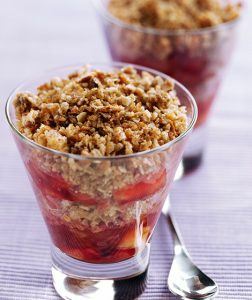 Nigel Slater’s crumble recipe is a classic – and there’s a reason for that: it’s simply scrumptious and the oats in the topping make it extra crunchy. This is just a taster (or should that be a ‘tasty’) of the ways you can enjoy oats. We’d love to hear your own tips too, so why not head over to Twitter and share your ideas with us @WhyWholeGrain.